BroadcastExchangeExec is a Exchange unary physical operator to collect and broadcast rows of a child relation (to worker nodes). BroadcastExchangeExec is created exclusively when EnsureRequirements physical query plan optimization ensures BroadcastDistribution of the input data of a physical operator (that can really be either BroadcastHashJoinExec or BroadcastNestedLoopJoinExec operators). BroadcastExchangeExec uses BroadcastPartitioning partitioning scheme (with the input BroadcastMode). doExecuteBroadcast waits until the rows are broadcast. doExecuteBroadcast waits spark.sql.broadcastTimeout (defaults to 5 minutes). doExecuteBroadcast is part of SparkPlan Contract to return the result of a structured query as a broadcast variable. When "materialized" (aka executed), relationFuture finds the current execution id and sets it to the Future thread. relationFuture requests child physical operator to executeCollectIterator. relationFuture records the time for executeCollectIterator in collectTime metrics. relationFuture accepts a relation with up to 512 millions rows and 8GB in size, and reports a SparkException if the conditions are violated. relationFuture requests the input BroadcastMode to transform the internal rows to create a relation, e.g. HashedRelation or a Array[InternalRow]. For a Array[InternalRow], relationFuture transforms the InternalRows to UnsafeRows and requests each to getSizeInBytes that it sums all up. relationFuture records the data size as the dataSize metric. relationFuture records the buildTime metric. 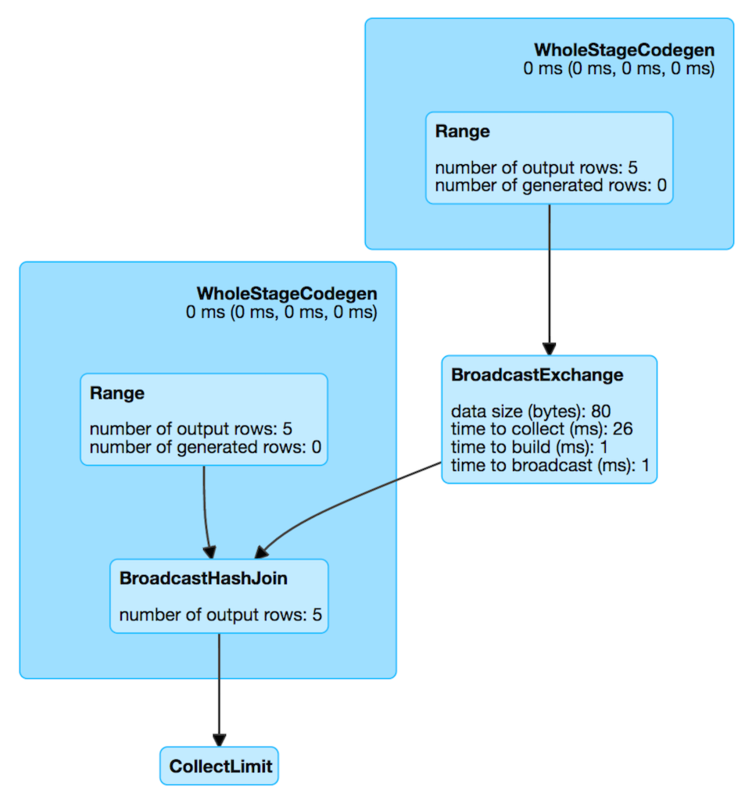 relationFuture requests the SparkContext to broadcast the relation and records the time in broadcastTime metrics. In the end, relationFuture requests SQLMetrics to post a SparkListenerDriverAccumUpdates (with the execution id and the SQL metrics) and returns the broadcast internal rows. Since initialization of relationFuture happens on the driver, posting a SparkListenerDriverAccumUpdates is the only way how all the SQL metrics could be accessible to other subsystems using SparkListener listeners (incl. web UI). relationFuture is executed on a separate thread from a custom scala.concurrent.ExecutionContext (built from a cached java.util.concurrent.ThreadPoolExecutor with the prefix broadcast-exchange and up to 128 threads). relationFuture is used when BroadcastExchangeExec is requested to prepare for execution (that triggers asynchronous execution of the child operator and broadcasting the result) and execute broadcast (that waits until the broadcasting has finished). doPrepare is part of SparkPlan Contract to prepare a physical operator for execution. doPrepare simply "materializes" the internal lazily-once-initialized asynchronous broadcast.